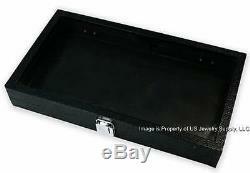 12 Black leatherette finish glass lid utility display cases with flat black pad inserts. Each case measures approximately 14 3/4"W x 8 1/4"D x 2H. Handy for storing and organizing items. Please read this important information. If you need longer, please let us know. We want your shopping experience with us to be easy and hassle-free. 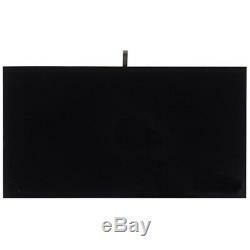 We guarantee our items to be as described and free of defects. Any problems should be reported to us within 72 hours of receipt of your item. We are not responsible for incidental or consequential expenses. 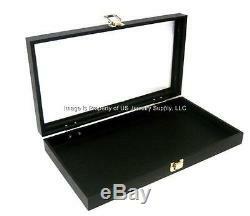 The item "12 Black Glass Lid Utility Jewelry Hobby Display Storage Sales Cases with Pads" is in sale since Wednesday, February 21, 2018. This item is in the category "Jewelry & Watches\Jewelry Boxes & Organizers\Jewelry Holders & Organizers\Multi-Purpose".llc" and is located in Panama City, Florida. This item can be shipped worldwide.